How can the histories of controversies affect decisions being made today? My work in the history of science probes the porous boundaries between science and culture over the past two centuries. Much of it gestures toward the role of history in public policy. I am interested in having the historian at the table while a scientific controversy is ongoing. We historians are rather good at illustrating that controversies have histories: how we arrived at where we are today is very informative. There have always been, and always will be, alternatives. The types of questions I am interested in investigating include: how stable are the concepts of ownership and knowability over time, extended to the molecular level of DNA? What has been the influence of natural scientists, engineers, and scientific instrument makers on musical aesthetics from the early nineteenth century to the rise of computer music? How have their interactions changed the relationships between composer, performer, and musical instrument? How do partisan beliefs intermingle with the specialization of technical and scientific knowledge, social status, and the politics of labor? Specifically, I am working on two projects, one in the history of molecular biology and biomedical research and one in the history of physics and technology. Both projects necessitate a disciplined interdisciplinarity, which ties together a myriad of fields from the humanities, social sciences, and natural sciences. The types of histories of science I write attempt to explain scientific and technical content in terms of its historical context. In so doing, I draw upon the methodological tools provided by historians, natural scientists, philosophers, sociologists, and anthropologists. I am fascinated by the way in which molecular biology has challenged traditional legal and scientific concepts and practices, such as knowability, ownership, genetic information, and knowledge sharing. Gene patenting and genetic information offer us prime examples of the instability of ownership and knowability. During the early 1980s, when genes were initially awarded patents by the United States Patent and Trademark Office, the Japanese Patent Office, and the European Patent Office, the procedure was to isolate a gene, determine the function of its protein product by biochemical assays, and then patent it. The procedure first required knowability (i.e., knowledge of what the gene coded for) before ownership could be granted: one needed to know what one owned. By the 1990s, that had changed. Broad utility patents were being issued for rather vague statements about a gene's utility. That is to say that one could obtain a patent for a gene, coded for a protein whose precise function remained unclear. In this case, one owned something before one precisely knew what one had. With this change in the relationship between ownership and knowability came a change in expertise. Previously molecular biologists and their "wet" skills, techniques, and practices had been necessary to define the function of the gene product and therefore its utility. By the 1990s, their authority had been controversially usurped by a generation of computer scientists who had invented algorithms to find gene sequences with unprecedented rapidity and who had begun to model proteins using computer graphics with a view to find structural homologies and deduce similar functions. The tools and skills of the computer scientist were now seen as both necessary and sufficient to ascertain knowability. This transformation in expertise raises a number of interesting questions. Does the sequence (or genetic information, specifically the genetic code as it appears in the patent description) trump materiality to convey ownership? Do patent owners forfeit their right to ownership if they patent an incorrect sequence, an occurrence much more common than one might believe? Is the gene sequence sufficient to determine protein function? How has bioinformatics changed both intellectual property and the discipline of molecular biology? How has gene patenting thwarted knowledge sharing and encouraged secrecy? Theories of ownership have become particularly relevant now that personal genomics companies are selling access to their databanks containing their clients' genetic information to various interested third parties such as Big Pharma. There are also fears that some companies might sell their anonymized data to insurance companies. While one may naïvely think that these customers "own" their DNA, the situation is much more complicated. Companies such as 23andMe and AncestryDNA are presently at the center of another controversy in biomedical research, namely how we understand human diversity. Comparing the DNA sequences of various populations represents the most recent episode in a centuries-long tradition of human classification based on the biology of difference. This history often evokes painful memories, which include the eugenics movement and the Tuskegee Syphilis Experiment. Rather than basing the biology of difference on external characteristics, some (but certainly not all) molecular biologists are asking whether internal DNA sequences might be more accurate and precise. And should we define different populations with different genetic markers as "races"? Can one ascertain the "race/races" of an individual from her DNA? What are the sociopolitical implications if one can? What are they if one cannot? Personal genomics companies advertise directly to U.S. consumers, who wish to find out about their ancestry and possible ailments, which might afflict them in their future. A number of biomedical researchers are less interested in ancestry and more interested in how different diseases affect different populations. These scientists are also keen on tracing human migration over a period of tens of thousands of years. DNA is a type of historical archive, and the skills of molecular biologists enable us to read and understand it. These biomedical researchers are certainly not racist. On the contrary, many of them argue that the field of race and genomics is about redressing the sins of the U.S. medical community's past, when marginalized populations suffered greatly. Interestingly, there has been pressure from different sectors to use race as a proxy for human genetic diversity. For the National Institutes of Health, requiring data on the safety and efficacy of drugs on women and people of color is important medically: the white male should no longer stand as the universal symbol for health. The use of race now, unlike the past, is about inclusion, not exclusion. Critics, however, maintain that—even if one could precisely define "race"—we might be reentering a dangerous age of genetic essentialism. And many point to the fact that Big Pharma and personal genomics companies capitalize on using race as a potent marketing tool. My second project deals with the history of physics and technology. I am currently working on the relationship between music, the natural sciences, and engineering over the past two centuries. It is a continuation of my earlier work on the triangular exchange between physicists, musicians, and instrument makers in nineteenth-century Germany. I am particularly interested in analyzing how scientists and engineers helped shape musical aesthetics. For example, during the late 1820s, the physicist Wilhelm Eduard Weber mathematically determined the specifications of a reed pipe, which in the hands of an experimental physicist was used to test directly the ratio between the increase in pressure and density of the sound wave. Such a value was critical to the study of adiabatic phenomena, or ones in which heat is neither liberated nor absorbed. In the hands of an organ builder, those specifications produced a compensated reed pipe, which meant that the organist could increase the volume of the pipe without increasing its pitch. Organs could now be rendered expressive, marking an important aesthetic change of the mid-nineteenth-century organ performance. The work of the nineteenth-century doyen of physics and physiology, Hermann von Helmholtz, directly led to the duplex scaling tuning technique patented by C. F. Theodore Steinway in 1872, a fact that the Steinway & Sons advertised when selling their highly coveted pianos. Helmholtz provided piano makers with the theoretical calculations of the relationships of the intensities of upper partials to the fundamental tone given the length of time a piano hammer comes in contact with a piano string. Steinway was able to draw upon Helmholtz's guidelines to generate sympathetic resonance in the non-speaking portion of a string, thereby creating the proper upper partials in their correct intensities, resulting in a much richer tone. During the late 1920s and '30s in the city of Berlin, a group of applied physicists, physiologists, engineers, and musicians tinkered away inventing new musical instruments and genres. The technical expertise of radio engineers, combined with the musical expertise present in the Berlin Hochschule für Musik (Conservatoire) and the financial backing of German electrical companies and the Prussian Ministry of Science, Art, and Popular Education, enabled the production of a new electric musical instrument, the trautonium invented by the physicist and engineer Friedrich Trautwein. It could be used for microtonal pieces and could mimic the timbre of numerous more traditional instruments. Engineers, physicists, and physiologists working on the analysis, synthesis, and broadcasting of speech and music on the radio provided musicians with the long-coveted ability to generate new tones. And musicians borrowed techniques used by physiologists and physicists in order to create new types of music. Rather than considering the trautonium an example of entartete Musik, or "degenerate music," the Nazis embraced the instrument, which was often featured on the radio and even made an appearance at the ceremonies of the Berlin Olympic Games in 1936. Various versions of the trautonium survived after the war, the most famous of which was the Mixtur-Trautonium, built by the performer, physicist, and composer of film scores Oskar Sala, who had worked with Trautwein in Berlin. It is perhaps best known for being featured in The Birds, the classic film produced and directed by Alfred Hitchcock in 1963. The screeching sounds of the birds as well as the flapping sounds of their wings were not natural, but were artificially generated by the Mixtur-Trautonium. The collaboration between physicists, radio engineers, and composers lasted well after the end of World War II. One only needs to think of musique concrète, created by the composer and radio engineer Pierre Schaeffer and the composer Pierre Henry at the Club d'Essai studio of the Radiodiffusion Télévision Française in Paris, or the collaboration between the composer Herbert Eimert, the aforementioned Trautwein, the information-theory physicist and acoustician Werner Meyer-Eppler, the sound engineer Robert Beyer, and the composer Karlheinz Stockhausen at the Cologne Studio für elektronische Musik of Westdeutscher Rundfunk (Studio for Electronic Music, West German Radio), or the music for magnetic tape of John Cage and Bebe and Louis Barron and the tape music of Otto Luening and Vladimir Ussachevsky that dominated the New York music scene in the early 1950s. Over a period of two hundred years, the relationship between performer, composer, and musical instrument maker has been completely transformed. On July 25, 1926, the avant-garde composer Paul Hindemith wound up a Welte-Mignon reproducing piano (similar to a player piano) at a performance in Donaueschingen in the Black Forest and left the stage, allowing the instrument to execute the piece. The piano finished the composition, and there was an uneasy silence. Should the crowd applaud? There was no human sitting there, only a machine. Finally, after an embarrassingly long pause, a quiet applause broke out, and it grew louder. The audience cried out "da capo." And sure enough, the piano played the piece again, as precisely as it did the first time. The machine (in this case a musical machine) had become the virtuoso. The cult of the nineteenth-century virtuoso, epitomized by Niccolò Paganini and Franz Liszt, had now been usurped by the machine. In 1930, the avant-garde composer Edgard Varèse, who collaborated with physicists and engineers and visited Bell Telephone Laboratories several times, (in)famously declared that the performer, the virtuoso, should no longer exist: she would be better replaced by a machine—and he was convinced one day, thanks to science and technology, that would indeed happen. And the wondrous sounds produced by radio laboratories after World War II are now generated by computers. A musical instrument maker looks more like computer engineer in this case. A number of my former students, who are composers, boast that they cannot really play a traditional musical instrument. They learned the craft of composing on the computer. A second theme in the history of physics and technology that has always interested me is the complex and historically contingent relationship between scientific skill, science and technology transfer, the communicability of scientific knowledge, and the politics thereof. In this particular case, I am interested in what happened throughout the nineteenth century with the hope of coming to terms with those relationships today. What is the status of manual labor vis-à-vis intellectual labor? What types of intellectual skill can be mechanized? Questions concerning the management of such labor are predicated upon whether that labor is communicable and if so, how. The implications of these questions are tremendous. How should scientific knowledge be taught to future scientists and engineers? How can technological, commercial firms achieve the critical balance between public and private knowledge to ensure market success and future viability? Answers to these affected the discipline of physics. In the nineteenth century, a professional class of (nearly exclusively) men began to emerge—the scientists—who dedicated themselves to the study of nature. As specialization of labor began to increase in society in general and within the scientific enterprise in particular, issues involving the nature and status of artisanal knowledge with respect to scientific knowledge and its management became more and more relevant and indeed politically charged. The politics of labor can offer insights into how these issues were solved then and into how those solutions affect decisions being made today. 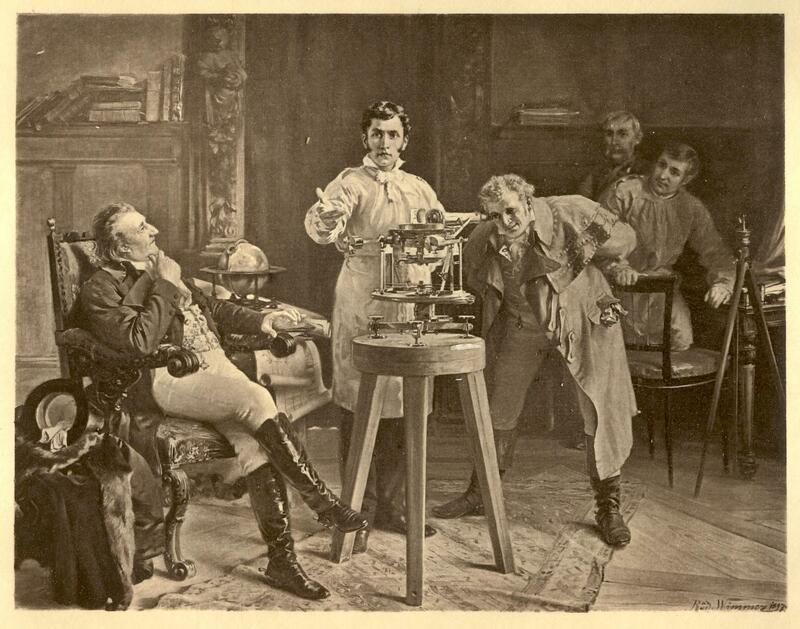 Nineteenth-century handwerker and optician Joseph von Fraunhofer demonstrates his spectroscope. Whether one considered Fraunhofer’s work science depended, in part, on one’s views about his social status. One of my earliest projects analyzed the importance of artisans (scientific instrument makers) to the discipline of nineteenth-century astronomy. It was a story about social class, manual skill, mechanization, patent laws, and the Industrial Revolution. It was also a depiction of the relationship between manual and intellectual work at a time when both types of work were undergoing profound changes. What was the status of craft knowledge vis-à-vis the knowledge of experimental natural philosophers? Although instrument makers were critical to the advancement of nineteenth-century science, why were they often (although not always) denied the recognition and privileges of experimental natural philosophers? I used the work of the Bavarian handwerker and optician Joseph von Fraunhofer as a heuristic tool to trace the ever-changing contours between science and culture. In both Bavaria and Britain during the 1820s and '30s, heated debates raged about the status of skilled artisans within experimental natural philosophy. The political responses of several leading British experimental natural philosophers to Fraunhofer's artisanal optics mapped nicely onto various aspects of British society, such as mechanization, royal patronage of the sciences, industrial efficiency, and patent laws. Differing responses to precision-technological practice in the nineteenth century were deeply embedded in more encompassing political beliefs. Whether one considered Fraunhofer's amalgamation of the secret and craft traditions to be science depended, in part, on one's views about his social status. While I hope the histories that I write are interesting and informative, their morals are certainly politically relevant and resonate today. Biological entities were not always patentable or seen as commodities. Similarly, human genetic variation does not necessarily need to be linked to so-called racial differences. Historians need to point out that neither the patenting of genes nor the categorization of human difference as racial is inevitable. We are obliged to inform others of times when alternatives were presented only to be erased from the collective memory. Based on my work on gene patenting I was asked by the American Civil Liberties Union to write a deposition for the Southern Court of New York on why precedent cases invoked by supporters of gene patenting were not actually applicable to genes. District Court Judge Sweet agreed with us, and genes were deemed non-patentable. The case was appealed and went all the way to the United States Supreme Court, and I was asked to co-author an amicus curiae brief. On June 13, 2013, the Supreme Court argued unanimously (9—0) that genes merely excised from the genome are not patent eligible as they contribute nothing to the art. cDNA copies of those genes, however, are products of human hand in the laboratory and are therefore patent eligible. Similarly, as a result of my work on craft knowledge, I entered into an interesting collaboration with mathematicians, physicists, and engineers at the Fraunhofer-Institut für Techno- und Wirtschaftsmathematik (Fraunhofer Institute for Industrial Mathematics) in Kaiserslautern, Germany. They were able to construct a robot that could cut precious stones more precisely than their human counterparts. What are the socioeconomic ramifications of such an invention? What would happen to the jewelers who would be replaced? How could they be retooled most efficiently? Where could their expertise be most effectively channeled? How could a historian analyze that process, and along those lines, what is the relationship between intellectual and manual labor that would ensure both the well-being of the workers as well as the market efficiency of the company purchasing the robot? I hope to continue this research by discussing with German politicians and employees of the Bundesministerium für Arbeit und Soziales (Federal Ministry of Labor and Social Affairs) how Germany has been so successful in retraining its labor force. I very much look forward to pursuing all of these passions at the Institute for Advanced Study, the Faculty and annual Members of which provide an amazing array of intellectual acumen in history, the social sciences, mathematics, and natural sciences upon which I shall draw. Myles W. Jackson joined the Institute for Advanced Study as a Professor in the School of Historical Studies in July 2018. His research intersects science, technology, aesthetics, history, and society and his scholarship, which interweaves economic, commercial, and scientific insights, has had lasting impact. He is noted for his cross-disciplinary methodology and range of study—from the artisanal production of scientific knowledge in nineteenth-century Germany to issues of intellectual property, knowledge sharing, race and genomics, the interactions between musicians, natural scientists, and radio engineers, and bioengineering in recent decades.